4. Scoop potato into soup and discard potato skins. Coarsely mash potatoes into soup using a potato masher (or a fork). 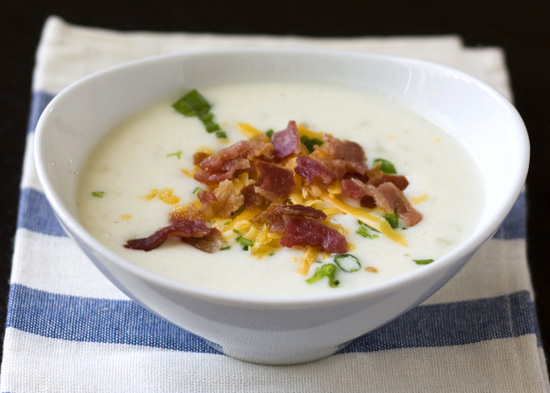 Ladle soup into four bowls and top with cheese, green onions, and bacon. This recipe is “souper” easy to make. See what I did there? I hope everyone is feeling on top of their game today. And, even if you’re not feeling under the weather like me, this is also good hang-over food. Very base-y. OK, sorry, I didn’t mean to remind you of last night. Enjoy this recipe, let me know what you think of it and HAPPY KITCHENING!